Music City Soul were a group of brothers that were highly talented, and experienced breakers, and were also Christian. We stopped the guys after the Dove Awards 2010 performance they did with Toby Mac. Watch as they show you some moves outside of the Grand Ole Opry. 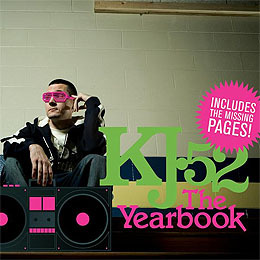 KJ-52 will be re-releasing "the Yearbook" with the "Missing Pages" a bonus disc of unreleased songs that were made for the Yearbook but got cut off, coming out October 14th 2008. KJ has a song you can listen to on his myspace that will be in the Missing Pages called "Stuck In The 80s." B.Reith Signs to Gotee Records with “The Forecast” EP Releasing This May. Gotee’s newest artist signing, B. Reith (pronounced R ī th), fuses together classic soul with modern hip-hop on his upcoming May 2008 EP The Forecast. Fans can take an early look and listen to B. Reith music by going to www.Gotee.com and checking out the EPK on this Milwaukee-native’s life story. KJ-52 Sells Half a Million Copies of the Yearbook? The 39th Annual GMA Dove Awards nominees have been announced just moments ago.